NASA officials will meet today (Dec. 2) to discuss whetherthe space shuttle Discovery will be ready for one last launch later this month,or must wait until 2011 to fly, following more than a month of delays andrepair work.? Top shuttle program managers will review the repairs made toDiscovery'smassive external fuel tank and review launch options for the shuttle'sfinal journey to the International Space Station. Discovery's STS-133 mission has already been delayed sinceearly November due to technical and weather-related issues. After meeting lastweek, NASA shuttle managers opted to forgoany launch attempts until Dec. 17 ? at the earliest. NASA has just a short window in which to try and launchDiscovery this month. The mid-December window closes on Dec. 20. If the shuttle is approved to launch on Dec. 17, liftoff wouldoccur at 8:51 p.m. EST (0151 Dec. 18 GMT) from Kennedy Space Center in CapeCanaveral, Fla., NASA officials have said. Engineers at the Florida spaceport recently completed workto plug a potentially dangerous hydrogen gas leak and reinforce cracked metalribs on Discovery's huge external tank. Officials had been aiming for a Dec. 3launch, but program managers did not feel they had a firm enough grasp of howthe problems originated, and decided not to proceed with the scheduled attempt. Discovery was slated to lift off with a six-astronaut crewon Dec. 3 at 2:52 a.m. EST (0753 GMT). The shuttle's planned 11-day missionwill deliver a storage room and Robonaut2, a humanoid robot, to the International Space Station. Two spacewalks arealso planned. If Discoveryis unable to launch in December, the STS-133 flight could be postponed untilFebruary, when the next clear cut launch window opens, agency officials saidlast week. 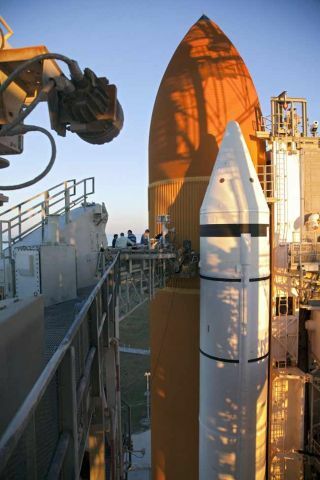 As it currently stands, NASA would be unable to launchDiscovery during most of January, due to unfavorable sun angles that couldcause parts of the shuttle to overheat while it is docked to the station. A couple of days may open up early in February, ahead of thenext launch window on Feb. 27, which was originally reserved for Endeavour'sfinal spaceflight ? the STS-134 mission. If needed, Endeavour's last mission couldbe rescheduled for the end of April, NASA officials have said.